Upholstered chairs have been around for centuries now and varied styles are still popular in homes today, whether antique or newly crafted. Learn more about several distinctive chair styles that were built with cushioned comfort and lounging in mind. The bergère (pronounced burr-jair) is a type of early upholstered armchair with closed sides that celebrated the change from more rigid, uncomfortable chair designs of the past when it was a brand new style. The sides are usually upholstered but can also be made of cane in some models. This type of chair was built for comfort with a long, wide cushioned seat. Backs can be high or low, and square, round, curved, or conical in shape. 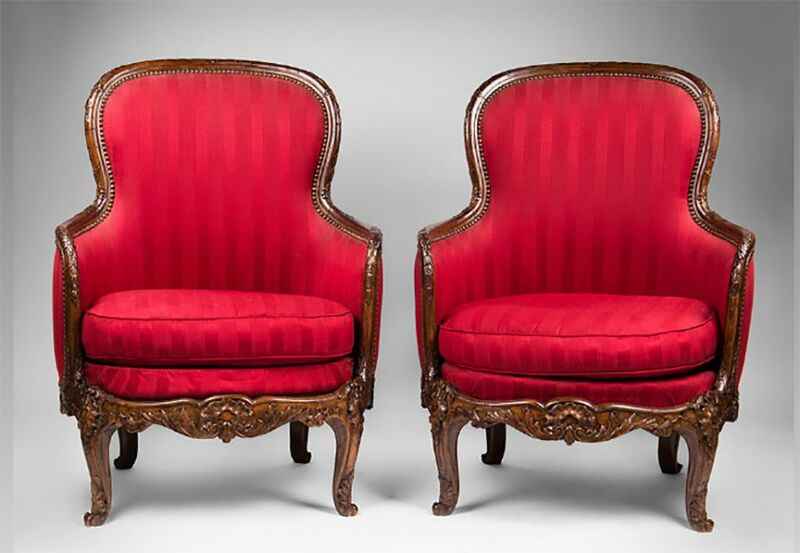 These chairs were first developed in France around 1725 at the end of the Régence period, and they flourished throughout the 18th century. They are characteristic of Louis XV, Louis XVI and other Rococo styles, but were adapted in many ways centuries later. Woods used in the arms and back trim can be painted, gilded, or natural in tone. This style is still as popular today as it was when it first came about for lounge use in stylish homes centuries ago. Fauteuil (pronounced foe-toy) literally translates to "armchair" in French. In reference to antique furniture, it specifically means an upholstered armchair with open sides like the one shown here. It was developed in the late 1600s in France, towards the end of Louis XIV's reign, and remained quite popular in the 18th century. The style not only became lighter and more graceful in appearance as time passed but also more ornate - the chair arms were many times upholstered to match the back and seat. Variations include the fauteuil à la reine (Queen's armchair), which has a square, high back as opposed to a rounded one like the example shown here. The term Morris Chair defines a deep, high armchair with an adjustable reclining back and cushions for the back and seat. It traditionally has spindle or slat sides and bow arms. This chair was named for Arts and Crafts proponent William Morris, and the original chair was actually designed by his business partner Philip Webb based on folk chairs found in Sussex, England. This style was first produced by Morris & Co. around 1869. The Morris Chair was widely copied and adapted by other furniture-makers during the Arts and Crafts period including Gustav Stickley. This style is often considered to be the precursor of modern recliners and was clearly developed with comfort and relaxation in mind. Any sort of armless, upholstered chair that sits low to the ground (around 15 inches, vs. the usual 17 to 19 inches) qualifies as a slipper chair. They tend to have high backs and rather wide seats. They became popular during the first quarter of the 18th century and flourished in the 19th century. The style experienced a revival in the mid-20th century. Designers John Henry Belter and Billy Baldwin are both known for their slipper chair designs. Slipper chair styles can vary enormously. From the thin, conical-backed Gothic Revival variety in the Victorian era to the squat, square-shaped style popular in Mid-Century Modern furniture, they have found a place in homes for centuries. This type of upholstered easy chair, usually taller than it is wide, has two side panels or wings flanking the high back and closed panels under the arms, which are usually rolled. Depending on the period when the example was made, the legs can be straight, cabriole or (more rarely) turned with correspondingly varied feet. Pad and claw-and-ball feet are particularly common in these chairs. Though a precursor was known in France, the most familiar form developed in late 17th-century England to protect sitters from drafts or an overly hot fire and it remained popular both there and in the United States for 200 years. This chair type is often associated with 18th-century styles such as Queen Anne, Georgian, Chippendale, Hepplewhite, and Sheraton. The wingback chair is still popular in stylish homes today.